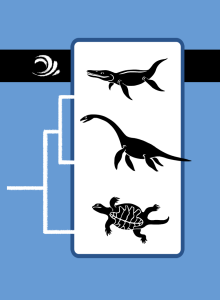 The sauropsids of the water are a Plesiosaurus, a Pliosaurus, and an Odontochelys, an early turtle relative. Early in the Mesozoic Era, several sorts of lizard-like sauropsids swam and hunted in the water. While some lines of sauropsids led to land-loving lizards, pterosaurs, and dinosaurs, other lines evolved into ichthyosaurs, plesiosaurs, turtles, and crocodiles. Plesiosaurus and its close relatives hunted by sight, but scientists aren’t sure what their long, stiff necks were for. Pliosaurus is also part of the clade of plesiosaurs, and they were top predators, guided by sight to ambush or pursue prey. No one is sure where the turtle line originated, but one popular idea is that they arose from the same clade that led to plesiosaurs, called Pantestudines. Ondontochelys had a shell only on its belly. The turtle line later diverged into some lines that live exclusively in the water, some only on land, and many that both swim in the water and crawl on land.